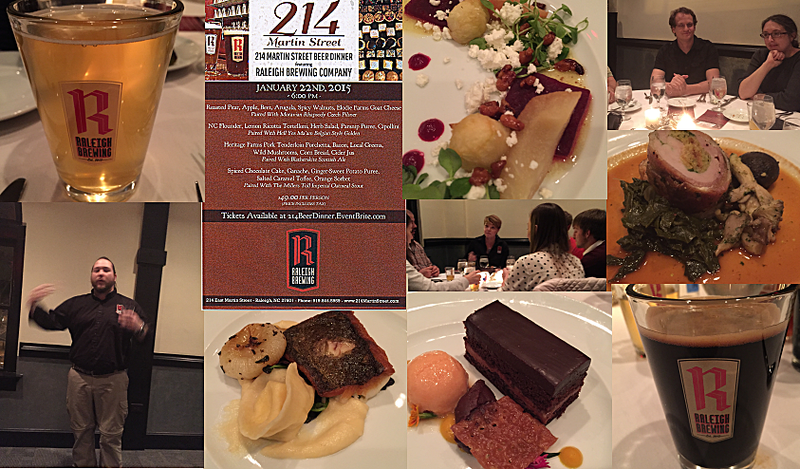 Thursday night the friends decided to attend the Raleigh Brewery Company’s Beer Dinner at 214 Martin Street. While our evening had a rocky start, all turned out well. I left work at 4:30 knowing I would be cutting it close to get to Belle and Bad Boy’s house. I had told them to go ahead with Uber and I would meet them there. There was a glitch with the first Uber driver, so they had to call another and I managed to be there before the second driver arrived. I thought we would be a few minutes late, but the traffic was horrendous, plus our driver seemed to be lacking in some basic driving skills. The dinner was to start at 6 pm, we arrived at 6:30 and they were just serving the first course, so it turns out our timing was not that bad. The dinner was located at the top of 2 flights of wooden stairs. I note this because (1) if you were intoxicated and fell you would be severely injured and (2) I have bad knees and it was not a pleasant climb or descent. We introduced ourselves to the other couples at the table consisting of; Sandy – an RN, her husband Bill – who dealt in party supplies, Carrie – who worked for the EPA, her husband Keith – who was a photographer, Mike – who is a civil engineer and Ann – who works in commercial real estate. We were a motley crew, but fun. The conversation was outstanding and we learned we had all found out about this Beer Dinner though the NC Beer Guys. I hope they will follow our blogs, since meeting the members of Triangle Street Eats. The first course consisted of roasted pear, apple, beet, arugula, spicy walnuts, Elodie Farms Goat Cheese paired with Moravian Rhapsody Czech Pilsner. The salad was delightful. The ingredients complemented each other. I thought the beets were a great addition. The beer, had a milder less beer taste, which was great for my palette. 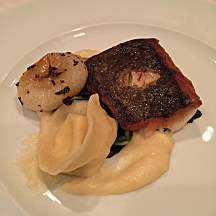 The second course was a North Carolina Flounder, cooked to perfection; lemon ricotta tortellini, herb salad, parsnip puree, Cipollini onion paired with Hell Yes Ma’am Belgian Style Golden. The parsnip puree and the Cipollini onion completed the flounder and the other ingredients. It was a hit with the table. Since I am not an avid beer connoisseur, the Bad Boy and the others at the table raved about the great taste of the Belgian beer. Some at the table even had seconds of the beer. The third course was a Heritage Farm pork tenderloin Porchetta, wrapped in bacon. It was a gastronomical delight, complemented with cooked greens, wild mushrooms, cornbread and a Cider Jus, which was the perfect touch to tie all of the ingredients together. The beer was a Blatherskite Scottish Ale. This beer was also a hit with the table. It was very hoppy. 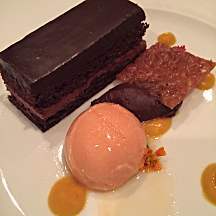 The final course was a spiced chocolate cake with a chocolate ganache, ginger-sweet potato puree, salted caramel toffee with an orange sorbet. While I normally hate sweet potatoes, this tasted very good. The chocolate cake was moist and the ganache was just the right sweetness. The orange sorbet was the ingredient that pulled everything together. It was paired with the Miller’s Toll Imperial Oatmeal Stout. It was too hoppy for me, but the other diners felt it complimented the dessert course well. 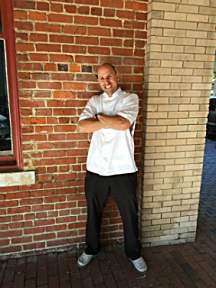 I would like to give my regards to Chef Matt Thompson, his staff and the servers for doing such a wonderful job with this dinner. The 214 Martin Street does a great job in events. A special thanks to the Raleigh Brewing Company’s, Billy Rutherford for giving great descriptions and histories of the beers served. I had such a great time talking and enjoying the dinner, I will be looking for other beer dinners to attend. Watch Triangle Street Eats twitter feeds @TriStreetEats and Facebook page for other fun events to attend.